Editor's Note: An earlier version of this transcript mistakenly attributed one of Michael Ware's questions to Maj. Gen. Athar Abbas. (CNN) -- Pakistan's military says it is in contact with Afghan's Taliban leader and that it can bring him and other commanders to the negotiating table with the United States. 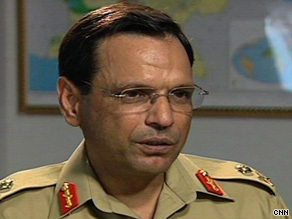 Maj. Gen. Athar Abbas says: "I think no counterinsurgency can be won only by the application of force." In an interview with CNN's Michael Ware, Pakistan military spokesman Maj. Gen. Athar Abbas said in return for any role as a broker between the United States and the Taliban, Pakistan wants concessions from Washington over Pakistan's concerns with longtime rival India. This is a partial transcript of the interview. It has been edited for clarity. Abbas: What we see as a concern is an over-involvement of Indians in Afghanistan that becomes a concern -- particularly if one is watching the security calculus in that. If you find a [indistinct] Pashtun, or if the Pashtun are not given their due representation in the government and the military... that causes concern. If you see an over ingress of the Indians into these areas, like their government, their ministries, their army. The fear is, tomorrow what happens if these Americans move out and they're replaced by Indians as military trainers? That becomes a serious concern. So these kind of apprehensions are there, and they are talked about and they are consulted. Ware: So what can Pakistan do to protect its interests in the face of these concerns in Afghanistan? What can you do? Ware: But sir, talk is so very cheap, I mean what sanctions or what leverage can you hope to have? Abbas: Well, every state has options, the states do not run out of options. We have our options also in this regard. Ware: Such as what sir? Ware: Come on, tell me something here sir. Abbas: Well the states do not disclose their options also, but there are options of how far you can go in supporting the coalition there. How far you can go accepting the Indian ingress there etc. So the states work out their own options in this regard. But the concern is the other side has to see the legitimacy of the concern. If the concerns are not legitimate then the other side would not buy. But this... if there are concern... take example of we have been informing the coalition that our situation in Baluchistan is a result of somebody working out of Kabul. We have informed them that this group is creating an uncertainty, an instability in Afghanistan and it is residing in Kabul. Ware: When historically you sit back and you look -- and you see that America, in Afghanistan, is now fighting against a number of its former allies from the 1980s. It was the Pakistani intelligence services that was so instrumental in assisting the American relationship in fighting against the Soviet occupation of Afghanistan. And in that regard, it was groups such as Hizb-e-Islami of Gulbuddin Hekmatyar, Jalaladdin Haqqani -- the Noorzai tribes of the south, the Pashtun tribes, indeed the tribe of Mullah Omar himself, these were very valuable partners -- American allies -- through the friendship of Pakistan. Now America finds itself fighting these exact men and these groups. How complicated is that? And how does that make Pakistan's situation more precarious? Ware: Must be difficult for you sir, being in the middle of all of this? Abbas: Yes certainly, yes certainly, we are in the eye of the storm. And as you said there is a history. Since last over 30 years this whole area is mobilized, it is on the move. The youth has grown, seen nothing but the bloodshed, fighting, and all this movement has caused them, deprived them of any education. They are only in the business of fighting, so therefore this has made the situation more complex. That the allies of the past have turned into enemies. Ware: And yet you're still in the middle between all these allies? Abbas: That's right. And that's what makes it difficult to understand others' position. That can only happen when you have an intense, uh, negotiations and engagement only then you can understand the real difficulties of operating against those people who were the allies in the past, and in the area which were the sort of a training centers of the past. Ware: Well those the exact same areas, are they not? The same red lines, the same sanctuaries... that America once supported them. Abbas: Yes, that's right. You see, in this area of the freedom fight against the Soviets was converted into the holy war, or the holy jihad though American literature which came from Nebraska. Abbas: Now that situation has reversed. It is we find these tribes on the other side, and it is difficult for their recruits or their people also to understand, why once we were allies are fighting against each other. So it is difficult to make them realize that look, there is a state, the state has some constraints of operation. The state has to take into account the national interest and therefore it cannot be allowed that you create all those centers here and cross over to Afghanistan and start killing the other side. So therefore these kinds of things is understandable to some but difficult to convince some of the other groups. Ware: Absolutely, and trying to explain this to the American public is an entirely different thing. I mean, to what degree can Pakistan's relationships with both sides -- both with the formal Mujahedeen fighters and with America, be a value today in trying to broker a solution? I mean, Pakistan's long had relationships with Hikmatyar, Haqqani, with the Pashtun tribes. To some degree, those relationships of course naturally continue. How can you use those relationships with these forces who were once friends of America, and now fighting America, of value to bring a solution? Abbas: Now we are getting into the politics of war. What the ISI [the Inter-Services Intelligence directorate] in the past had a very intense relationship because all - the whole coalition of the past were using them in Afghanistan. Ware: While America in fact turned to the ISI to have these relationships. Abbas: That's right, the ISI was in the forefront of the whole struggle against the Soviets. Now by maintaining the contact with the organizations like what you have mentioned of Hikmatyar and Haqqani, doesn't mean that the state as a policy is providing them the physical support or the funding or the training. It doesn't mean that. Because, you know after 9/11 the state had realized it is no more possible to sustain a policy of supporting the Taliban in Afghanistan. And therefore there was a U turn, and the state followed, the army followed, the ISI followed. But having said that, no intelligence organization in the world shuts its last door on any other organization. So therefore the contacts are there. The communication remains. But it doesn't mean that you endorse what they are doing in Afghanistan. You know you have nothing to do with it because your plate is full. You have enough in your plate. These all local Talibans and militants and terrorists who have turned inward on to the state is enough for the state to take care of and this is exactly what we are engaged in: Baujour, Waziristan, Moman, Kabar, Swat, this is enough for the state. Looking at our capacity, we have limited capacity we are not a global power. We have very small army and we have some gaps in technology also. We do need modern technology to fight this kind of war. And we have created our defense forces India specific, a conventional war specific. For this unconventional war we do require help, assistance, support in specific areas. Ware: In terms of Afghanistan, what is the solution, from the Pakistani point of view, what is the best way forward? Is there room for negotiation between America and the forces it's in conflict with? How does America get its way out of the situation in Afghanistan? Ware: Militarily? Because America cannot win militarily? Can it? Can America win with guns and bullets? Abbas: I think no counterinsurgency can be won only by the application of force. It has to go along with the political strategy, the political instrument; the development and the reconstruction also along with that. The military can create an environment, it can create temporary stability, it can bring back security but that would be temporary. It has to have the major stakeholders -- that being the administration, the civilians, the notables, the representatives, and the civilian police agency etc. who have to police the area. To take control of the security on the long-term basis, the military would give them a temporary security situation. Now we are very clear about this when we are operating in Swat, the military will provide them a temporary stability in the area. It would help also the civilian agencies, including administration and police, but then -- unless and until the major stakeholders, the people themselves, they have to take control of the area along with the police and the administration. Only then a lasting peace will return. Otherwise, it would keep on creating fighting in this area. The peace would not return on a permanent basis. Ware: General, I am getting the wind-up from your aide, just one last question. We saw great success in the Iraq theatre, where America engaged the insurgents it was fighting against and eventually put 103,000 Sunni insurgents on the American payroll that assisted them in their fight against al Qaeda, and it assisted America in its challenge to curb Iranian influence. Is there room for such negotiation here? In the Afghan-Pakistan theatre? Can America negotiate with the groups it's currently fighting with? Abbas: Certainly -- I think that you can't use one formula in dealing with various groups. This is not a monolithic organization. How we look at Pakistani-Taliban is not a monolithic organization. Ware: And how you look at Afghan-Taliban is totally different. Abbas: Absolutely, they are totally different. Ware: But can America talk to these groups? Can America... is part of the solution, America negotiating with these forces? Abbas: There are reconcilable elements in these whole, in this whole Taliban groups etc. and one has to identify those and they are reconcilable and when there is no harm in negotiating...opening a negotiation with them. Abbas: That's right, dialogue. Eventually one would have to return to the dialogue table. Ware: And that's where Pakistan can perhaps provide valuable assistance to the American mission. Abbas: I think yes that can be worked out, that's possible.